As a solid material experiences an increase in temperature, the volume of the structure is ultimately impacted by increasing, a phenomenon known as thermal expansion. This process results from heat's ability to increase a material's kinetic energy. Within solids, molecules are typically located in close proximity to one another, contributing to the defined shape of the structure. As the temperature rises, molecules begin to vibrate at a more rapid speed and push away from one another. This increased separation between the individual atoms causes the solid to expand, thus increasing the volume of the structure. 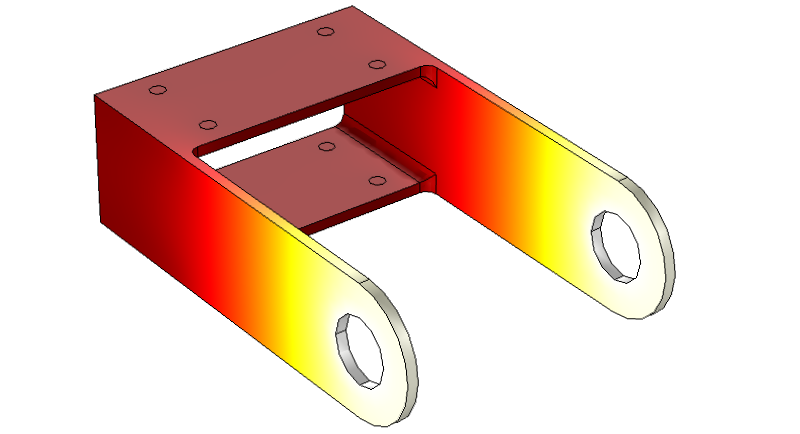 Temperature distribution within the bracket. With this volumetric enlargement, the elements of a solid undergo greater levels of stress. Thermal stresses can have a significant effect on a structure's strength and stability, potentially causing cracks or breaks within certain components. Such failures compromise the overall design of the structure, which can lead to possible weakening and deformation. Residual stress in welding is just one example. In welding, a bond is formed between metal parts by melting their surfaces and placing them together so they are joined when the materials solidify again. As the assembled structure cools down, some areas of the welding tend to contract more than other areas due to differing thermal expansion coefficients. This causes residual stresses within the area of the weld. In the areas of greatest stress from the applied temperature (shown in red), the bracket experiences deformation. Within the design process, it is important to account for thermal expansion and the resulting stresses to achieve optimal performance. 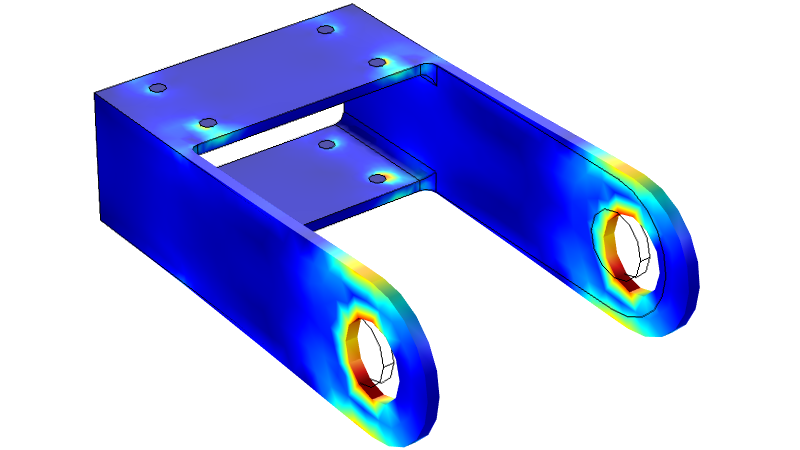 This involves investigating the relationship between heat transfer and structural mechanics, focusing on the materials of the structure as well as the displacement fields. Take expansion joints, for instance. They are often implemented into the design of buildings, bridges, and railways to help release internal stresses caused by an increase in temperature. These mid-structure separations compensate for movement and are crucial to alleviating structural components of thermal stress and helping to control cracking within structures. In some cases, however, thermal expansion, and the stress it creates, is embraced in design. In a process known as shrink-fitting, an external component is heated to the point of expansion with the goal of mating it with its internal component. This heating technique forms a joint, creating an immovable bond between the two individual parts. This joint becomes stronger as the two components reach the same temperature. Heat exchange between a coolant duct and stator blade in a gas turbine. Designed to handle high levels of pressure and temperatures, gas turbines are comprised of components that can endure extreme conditions. As hot combustion gas flows through the stators and rotors of the turbine, there is potential for these components to rupture and fail. To prevent this deformation, colder air is drawn from the bleeding vanes in the high-pressure compressor casing and pushed by the combustion chamber and into the turbine casing. This acts as a coolant to help stabilize the components under these intense conditions. Film cooling over the blade side surfaces and internal cooling within ducts are applied directly behind the combustion chamber to provide the turbine with greater resistance to thermal stresses. The heat exchange between the stator blade and the internal cooling duct leads to temperature gradients within the blade. This displacement of temperatures within the blade helps to cool down the overall structure and prevent the entire blade from reaching the temperature of the combustion gases. The presence of coolants restrains thermal expansion within the gas turbine and the potential stresses that can result from this increased volume.